Our assembly is coming up and we will be performing ‘Giraffes Can’t Dance’. 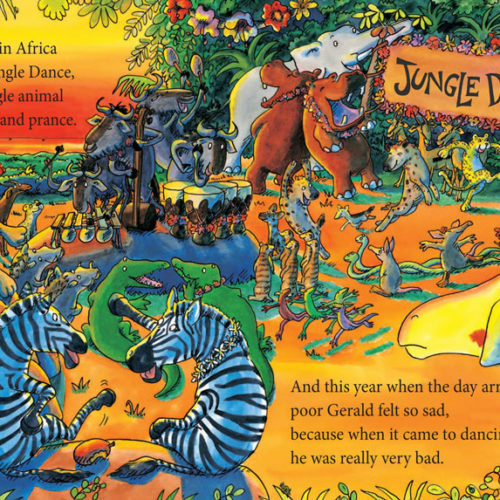 In the story, Gerald the Giraffe wants nothing more than to be able to dance like the other jungle animals at the Jungle Dance. What animal do you want to be? Would you prefer to be an animal who dances (see pictures)? Or to be a different animal? Who would like to be Gerald the Giraffe? The assembly script will go out on Tuesday. Answers before then please. You would be a wonderful girafffe, Casey! I would like to be the lion that can dance because i like lions and i can dance. I’m looking forward to seeing your dance moves, Cooper! I want to be a rhino. Because the rhinos dance the rock ‘n’ roll. The rhinos do look very cool dancing to rock ‘n’ roll. I would Like to be a tiger but I would like to be a prowling tiger not a dancing tiger. I would like to be the cricket because I like insects. I thought you might have chosen a rhino, Alexander. You’d be great as a cricket too. I would like to be Gerald the Giraffe as I am tall like a giraffe. If I can’t be gerald I’d like to be a lion and dance the tango or a chimpanzee and dance the cha cha!!! I love to dance! I would like to be a leopard that does not dance because i like leopard print! I like leopards too, Isabel. That’s great to hear you already have a leopard costume, Emma. I would like to be a monkey and dance the cha cha cha! i would like to be a warthog please because they look strange. i don’t have a costume. I would like to be a warthog too please. Because they are funny. And odd. And they go snort snort. I would like to be a Lion but no dancing for me please, just talking! I would like to be a monkey because they are cheeky and I like being funny. But I would also like to be a lion. I would like to be the cricket because he is wise and I dontto dance. I told my mummy that I want Ellise to choose for me as I don’t mind which animal I am as long as I get to dance with all my friends!